Just curious: Does anyone happen to know where the IF kept the Faberge eggs and other gifts? I know that Nicholas gave many to his mother and his wife, but I've always been curious to know where they kept them...on shelves, in curios, etc. I believe that Queen Mary ended up with quite a few pieces, but she was known to have a knack for getting what she wanted. A few pieces are still missing, aren't they? Any ideas as to where they might be? Just curious. Please forgive my ignorance! I'm kind of new at this and I'm so sorry I posted in the wrong forum. I'll try to do better next time. 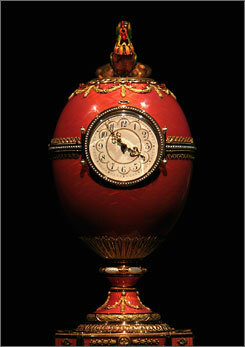 i have the great good fortune to see many of the Faberge Easter Eggs at the Forbes Museum in New York City. This was about 4-5 yrs ago, the eggs are not there now, unfortunately!!! i believe they were purchased and are now back in Russia. i had wanted to see some of the eggs all my life though, they were incredible!!! so, i feel very blessed to have seen them when i did. As I understand it Alexandra kept her eggs at teh Alexander Palace in the corner cabinet of the Maple Room as well as a special display case in the bedroom. The ggs were presented to her by Faberge himself usually at Livadia since that is where the IF spent easter. As I remember some of the eggs were gathered together for the 1901 (date may be wrong) worlds fair and I rememebr reading somewhere they were exhibited in St. Petersburg. Some went to the Winter Palace collection. 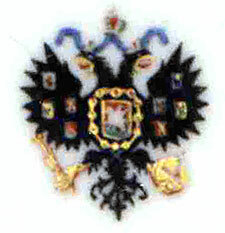 MF of coruse kept hers at the Anichkov Palace. After the revolution the remaining eggs were gathered together as part of the Diamond Fund I beleive and then sold abroad. Some remained in Russia probably due to their historic value or simply thaty the did not sell. One such Egg was the Pamyatt Azova egg which contianed a replica of the ship the carried Nicholas as Tsarevich on his world tour. Ano0ther was the Siberian Egg. Armand Hamner bought and sold a large portionof them. As I understand it there current whereabout of all but 9 are known. The Last Imperial Egg which was completed but never delivered in 1917 I have only seen in pictures and is sometimes known as the TWILIGHT EGG. Its whereabouts are unknown... as well as others, largely from Maries Collection. The Imperial Collection of Faberge was shown in St. Petersburg in 1902 at the von Dervise mansion. The last 1917 egg has surfaced, about six months ago. Nick wrote an article about it for us, Im trying to find the link now. That would be cool I would love to see it !!! There is a big Fabergé exhibition this days in Brussels, except for all Forbes/Vekselberg Eggs, The Mosaic Egg and the 1917 Blue Constellation Egg, there are about 200 other Fabergé pieces! I was there yesterday and am still amazed at the beauty of everything I have seen there! I was reading in another thread about a Faberge frame that Nicholas II gave to Xenia and she later found it, quite by surprise in the collection of Queen Mary. Does anyone have a photo of this frame, which from what I read contained Xenia's wedding picture? The TEFAF,the annual Art and Antique fair in Maastricht,The Netherlands started last night.One of the items a gilded silver and guilloché frame by Fabergé,a gift from Grand Duke Michael Michaelovitch to his wife Countess Sophie von Merenberg at their tenth wedding anniversary. LONDON — A rare enamel-and-gold Faberge egg that had been in the Rothschild banking family for more than a century sold for record-setting $18.5 million at auction Wednesday. The sale of the translucent pink egg topped with a diamond-studded cockerel was a record for a Faberge work of art, Christie's auction house said. The price also broke the record for Russian artwork, excluding paintings, easily beating the $9.6 million paid for a Faberge egg in New York in 2002, Christie's said....The Rothschild Faberge Egg is one of no more than 12 such pieces known to have been made to imperial standards for private clients, Christie's said. The Faberge egg sold Wednesday originally was acquired by Edouard Ephrussi, who represented the Rothschild family's oil interests in Baku, in modern-day Azerbaijan. Ephrussi's sister, Beatrice, gave the piece as an engagement gift to Edouard de Rothschild and Germaine Halphen, who married in 1905. Christie's said it had remained in the family since. The piece was sold to a private Russian bidder after 10 minutes of bidding, Christie's said." The translucent pink egg contains a clock and animated cockerel and had never been seen in public before the sale was announced. The collection that once belonged to Forbes looks magnificent in the link to the book that they are trying to sell. The last time I saw the collection in person I thought I was very dirty and dusty. I hope that the new owner will take better care of the collection and have it cleaned on a regular basis. I remember a lot of dust and webs on the Chanticleer Egg and the Orange Tree Egg. I think I saw the collection at least three times over the years and even with the dust, it was still an amazing and beautiful sight. Faberge was unparalleled in his designs and executions of those designs. I don't think that Cartier ever came close. Just my humble opinion.